Workout earbuds that stay in really well. This is the higher-end version of them. People who want buds that absolutely won't fall, out and who don't mind spending a little more for the promise of better sound. The Limited Editions look much like the original Inspires. The buds still have the pointy, soft-rubber Twist Lock tips that keep them securely in your ears, but now they come with a flanged option for blocking ambient noise. They have Kevlar-wrapped cords that are tangle-resistant, and there's a mic with volume, track, and call controls (most of which is iOS only). Decide if you want the noise-blocking flanged or the unflanged tips, pick the best size for your earholes, put them in your head, and then twist them to lock 'em in. Then you listen to music through them. As with the other Yurbuds, this suckers are not going to come out. I ran with 'em, did sit-ups, and even burpees and they didn't so much as budge. Yurbuds was trumpeting the new "triple magnet sound technology" in these, so we were expecting a big step up in sound quality. We didn't get it. The balance is better, and the mids and especially the highs are cleaner, but they're still wimpy on the low end. Music isn't all about the bass, of course, but for exercise buds it becomes way more important, especially if you want to run to a beat. They don't sound bad, but they don't sound like hundred-dollar buds, either. 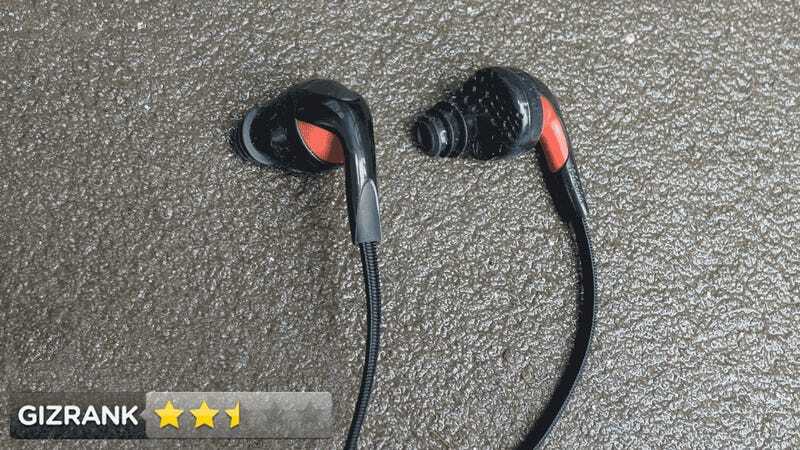 They are actually much quieter than the original Yurbuds. It's not that they're unforgivably quiet, but you have to notch up the volume a bit to match their much-cheaper counterparts. Love the cables. Not only do they feel extremely durable, but they are really hard to tangle. The flanged tips are slightly hard to get into your ear (without smooching them) than the standard tips. They also seem to run a bit bigger. They are sweat and water resistant. If they start getting funky, you can just rinse them off.